Hi boys and girls, how was your weekend? I really needed to relax after my travels to London and Paris last week so I didn't do much although the weather gave us a sunny foretaste of spring. Sometimes I believe I can rule the world from my couch, just with my laptop and smartphone. I got a whole lot of preparing done for my move from Düsseldorf to Aschaffenburg. There are so many little things you have to think about! Argh! 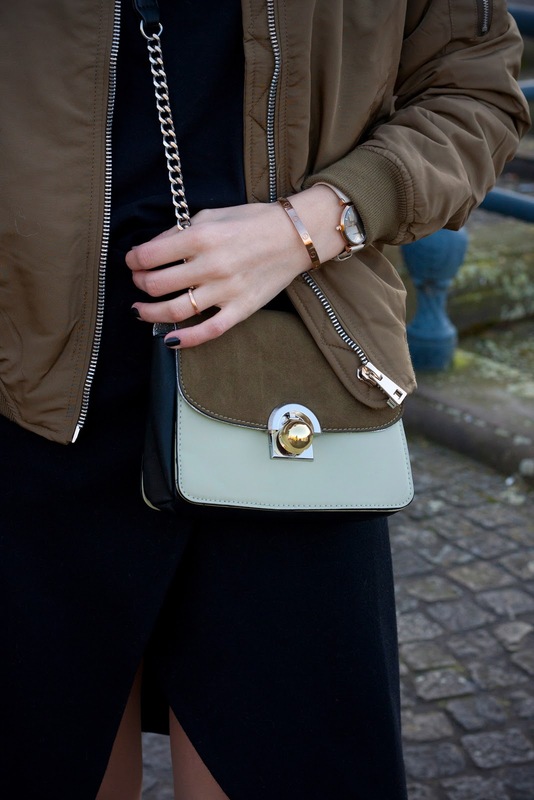 In today's photos I'm wearing the must-have piece of the season - the bomber jacket. On my store checks in London and Paris I saw sooo many different models, in different colours, fabrics and prints. You really can't get around buying a bomber jacket for spring. I decided to get the classic version in khaki and with stretch cuffs first (I will probably get another one with a print and one in a pastel colour). 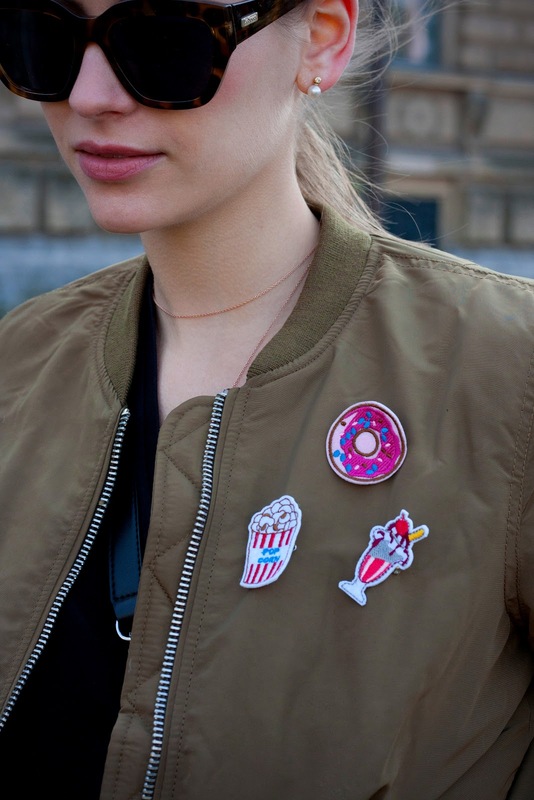 In London I then found these super cool 90s inspired pins in shapes of popcorn, a doughnut and milkshake, that I had to get to put on the jacket. Ich liebe ja den Knödel Look und trage ihn auch super oft. Bequem und praktisch - und damit auch perfekt in Verbindung mit einer Bomber Jacke. Das Outfit ist zwar jetzt so gar nicht meins, aber dir steht das wirklich gut :). Sieht cool und lässig zugleich aus. 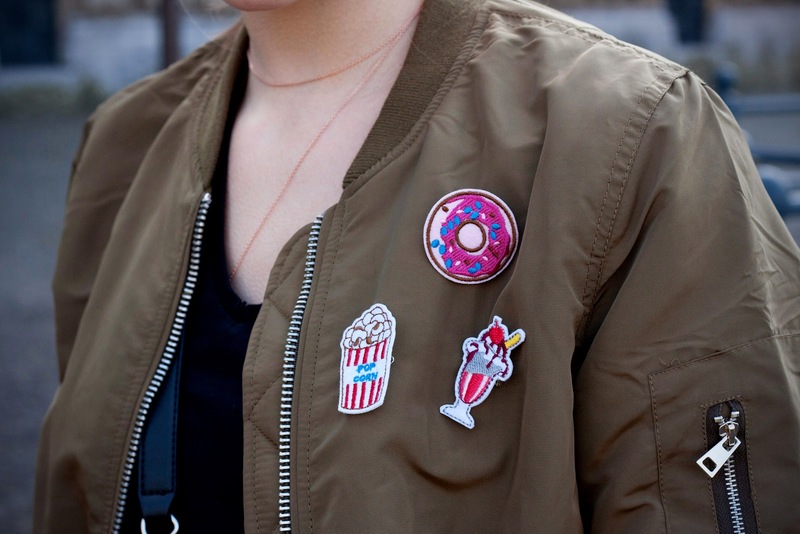 Love your bomber jacket! Goes perfect with your outfit! Mal wieder ein toller Look und schöne Fotos! Welche Kamera benutzt du eigentlich? Ich habe hier noch nie Fotos gesehen, die mir nicht gefallen haben. Ich finde die Kombination von sportlicher Bomberjacke zu elegantem Kleid so toll! Das freut mich sehr, vielen Dank! Ich benutze eine Canon 40D mit dem "klassischen Bloggerobjektiv", 50mm 1.8. Das Outfit ist der Hammer! Ich finde die Kombi der Bomberjacke mit dem Kleid sehr cool. Big like!